What does Higher Ed have to Say? Telling Your Story: Making Sense of Diverse Learning Experiences A Q&A with AAEEBL President Trent Batson By Mary Grush (April 23, 2014). Trent Batson stated " I think what's being missed is that ePortfolios stay with the student. They are literally owned by the student. A student builds his or her story on how well they understand the changes they are making as they go through college. Looking at a student's ePortfolio, we are able to see evidence of learning from semester to semester and from year to year, and having capstone requirements means that students have to make sense of what they have learned during a course, or over the last year, or over multiple years. This is what students are discovering about themselves, and the story that they can tell about themselves at the end of a year, or at the end of college." 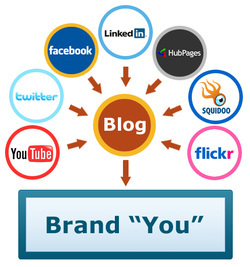 Students should build a personal brand utilizing social media. The goal of earning a degree is to secure your future in your chosen career. When you develop an electronic portfolio/website you have completed only the first step in establishing your personal brand or "Brand You!" Alyssa Hammond, Associate Director of Undergraduate Career Services and Adjunct Professor at Bentley University observed that "good grades without a strong personal brand may not lead to immediate employment. This is one of the reasons that I am striving to incorporate assignments utilizing social media within several courses that I teach at the University of Utah. There are simple yet powerful ways that students can utilize projects that they have completed in their classes to demonstrate their ability to communicate, think critically, conduct research, and solve problems. To help her students, Hammond created a social media course that focuses on building a personal brand through social media. "Students need to know how to use Twitter for their own personal branding because people are using it and really gaining a lot of notoriety," Hammond says. "The goal of this class is to give them a good education into what these various systems do from a branding perspective." Puja Shah, a recent graduate from Hammond's stated that "We were able to understand how it could benefit our own lives through branding on the web but also how social media can help companies to brand themselves." . . . "I know [this class] will be helpful to me as I enter the real world." Check out Robin Fisher Roffer's 8 Steps to create a personal brand to jump start your career. This is a free recorded webinar (play on demand) filled with clear, actionable recommendations for establishing your brand and landing the job that will launch your career. During this next phase of developing the eportfolio, I will highlight each of the social media channels and how students can establish their personal brand. Check back for upcoming posts on Twitter, Pinterest, Facebook, Instagram, TripAdvisor, etc. Ensure your portfolio has a personal Voice! As Maya Angelou said, “When words are infused by the human voice, they come alive.” Strive to make sure your electronic portfolio and resume captures your personality, not just your academic and career accomplishments. I recommend incorporating your own voice through a variety of formats. Incorporating self- reflection on your own journey will provide a demonstration of effective communication skills. Employers will expect future employees to not only communicate effectively, but they need to possess the ability to express their ideas through the use of a variety of media. Why you might ask? Because communication technologies are evolving at a pace that is unparalleled in history. Consider for a moment how communication techniques have changed dramatically over time. Prior to 3500 B.C., communication among indigenous people was dominated by paintings until Egyptians developed hieroglyphics in circa 3200 B.C. 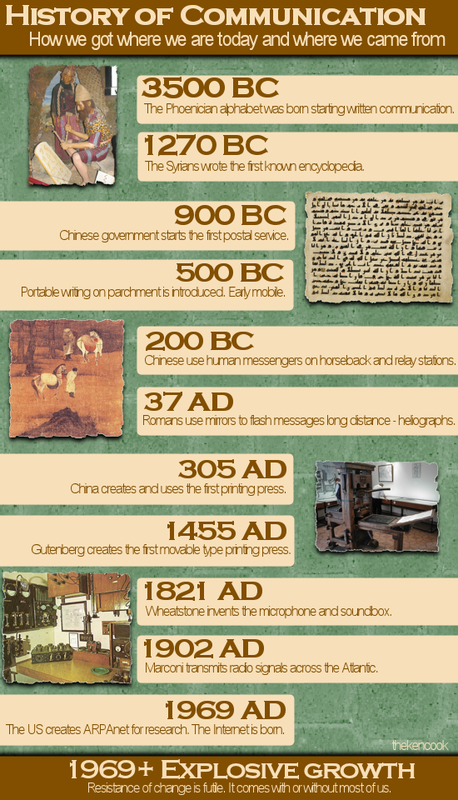 The first alphabet composed of 22 symbols (all consonants) evolved with the Phoenicians in circa 1200 B. C. As illustrated in the infographic above, communication proceeded to change with the Chinese inventing the first postal service in 900 B.C. followed by messengers on horseback delivered messages in 200 B.C., and the first printing press in 305 A.D. It would require another 1100+ years before Gutenberg would refine the printing press by inventing movable type. The Internet would not evolve until 1969. When we compare the progression from hieroglyphics to the Internet (a period of roughly 5400 years) with the progression from the first text editors in 1976 and the creation of HyperText Markup Language in 1978 followed by the World Wide Web in 1990, we should not be surprised that many people are lost in the information age. Check out this video on YouTube.com that illustrates the History of Communication. I particularly enjoy this presentation because there is humor, graphic design, and technology blended in an entertaining presentation (6:27 minutes). Technological advancement has been evolving at light speed since the launch of the web. 2002 – Social Networking started with Friendster, then MySpace followed by Facebook. 2010 - Pinterest introduced an image "pin board" with access by invitation only until 2012 when the Social Media provider skyrocketed to third place behind Facebook and Twitter. 2010 - Apple introduced Instagram an online photo-sharing and social networking service named for the similar format to the Kodak Instamatic Camera. 2011 – Online Content Collaboration requires a combination of web design, social networking, and word processing. Check out this YouTube video that illustrates the History of Social Media: A Timeline over 2 Decades (3:07 minutes). The video and the list above only highlights the major forms of social media that have evolved, but it is clearly evident that new channels of communication are evolving rapidly. Future graduates from our academic programs will need to demonstrate their ability to write clearly and utilize the latest forms of communication to convey information to the customers of the future. How will you demonstrate your communication skills and the effective utilization of the current channels of communication? How will you infuse your personality and professional skills through your eportfolio? Check back for further information on infusing your voice and demonstrating your skills in your eportfolio. The purpose of this post is to illustrate how a student could demonstrate their proficiency in editing an image in Photoshop. 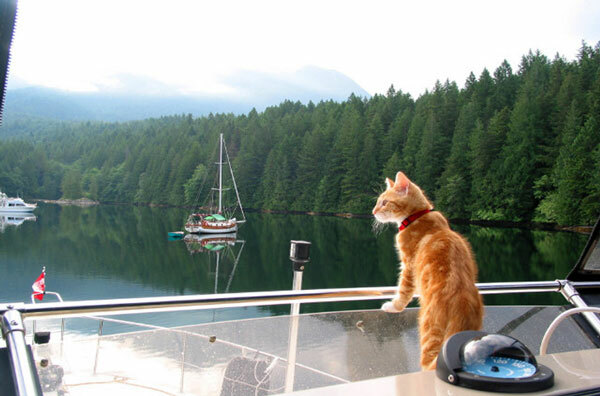 Captain Cat navigating students through a lesson on Photoshop editing tools. 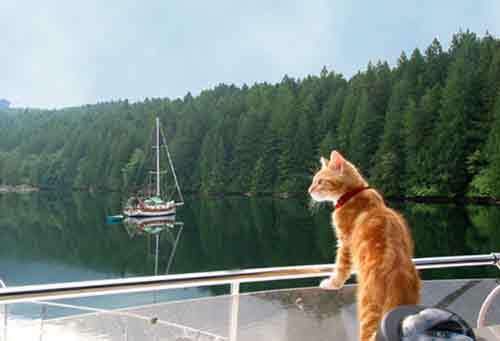 For example, the image above was a photo with several errors. The first step in this assignment is to identify what errors need to be corrected and how the image can be cropped to create a more dynamic photo. There are minimum of 6 errors that require attention. Can you find them in this photo? Revised image after correction. Can you identify the changes? When students prepare a resume to apply for a job they commonly indicate a proficiency in a software application or a skill with computer hardware. Unfortunately, what exactly does a proficiency mean for prospective employers. Therefore, it is important that the resume provide specific information clarifying what exactly you can accomplish with the software and/or computer hardware listed on your resume. This is where a showcase eportfolio can help you demonstrate your skills and establish expectations regarding your abilities as compared to other job applicants. Listing “Proficient in Photoshop” would lead me to believe you can work with photos and their layers, add text, and manipulate the images. However, you’re interpretation of “proficient” may mean that you can resize and crop photos. 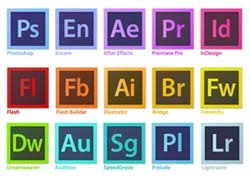 In order to avoid confusion and give the necessary information upfront, list out what you can do with the program, especially if using Photoshop is a big part of the job for which you are applying. Follow-up with before and after photos that you have edited using PhotoShop. 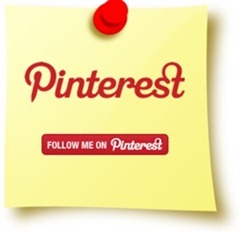 I have created several boards on Pinterest related to Careers, College Advice, and Jobs. The boards provide links to some of the most valuable news and statistics regarding trends in the hospitality and tourism industry. Helen Barrett's presentation on e-Portfolios as Digital Stories of Deep Learning is available on Vimeo at http://vimeo.com/23513397 . . . (Approximately 20 minutes in length.) She shares an excellent review of electronic portfolio. 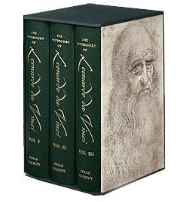 I loved her illustration that Leonardo da Vinci may have been the first famous person to develop a folio. His notebooks are certainly one of the most remarkable written record of his creative work in art, science and architecture. In fact, you can purchase a copy of his 3 notebooks from Amazon.com for $175. Most impressive. Provide valuable information for current and potential students interested in one or more of the courses I teach at the University of Utah. Beyond the course syllabi, sample lessons, and master calendars, I hope to provide examples of assignments completed in the fulfillment of course requirements. Demonstrate an example of an electronic portfolio for the students in my PRT 5460/6460 Electronic Marketing course. A well designed and implemented electronic portfolio provides an opportunity for the students to integrate modern communication technologies with age-old marketing principles as they develop their first website designed to showcase their academic preparation, skills, and knowledge. What should you consider including in an developmental or formative e-portfolio? Perhaps the most important difference between a standard eportfolio and an developmental eportfolio is the electronic repository of a student’s papers over the length of a course or curriculum and the student's self-reflection. A developmental eportfolio is a work in progress, an on-going composing and revising process. I will review the recommended contents of a developmental portfolio dividing the elements into 2 sections: Structural elements and In-progress Elements. Student Information: name, contact information, major, minor, graduation date, etc. The student's name and email should be available on each and every page of a well-designed eportfolio regardless of the purpose of the document. Navigation (Table of Contents) and/or index: You need to ensure that viewers of your eportfolio can find the information they seek with as few as 3 -5 clicks of their mouse. Every page should have a navigation bar either across the top of the page or along the either the left or right side of the page. An introductory or personal statement: The home page or landing page should include include a well-written statement describing the purpose of the eportfolio. Curricular standards and/or criteria: Include learning outcomes, accreditation standards, and/or general education requirements for the respective course or courses. Reference the course or curriculum requirements as you add documents and reflect on the learning achieved. Self-reflection/self assessment Blog: This is a critical and essential aspect of the developmental eportfolio. The self-reflection should occur across the duration of the course and/or curriculum that is the focus of the eportfolio. Include the learning outcomes, standards, and/or requirements that are relevant to the topic and/or assignment, particularly when you are reflecting. Rubrics: Many instructors now utilize rubrics to inform students of expectations and to analyze the student's assignment submission. Rubrics include a criteria-rating scale, which not only evaluate student performance they provide students with the information necessary to complete an effective self-assessment. Artifacts: Depending on the purpose of the developmental eportfolio, the student should provide a series of examples to illustrate their progression over time. 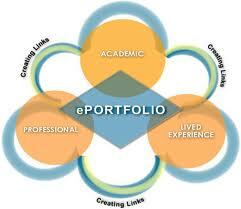 The developmental or formative eportfolio stresses indications of growth and/or improvement. Therefore, students should be encouraged to revise and improve documents following peer or instructor reviews. The examples of student work (artifacts) might include word processing documents, images, illustrations, charts, spreadsheets, video, audio, etc. stresses “symptoms of growth,” For example, a first draft or outline for an essay would be followed by the instructor's and/or peer feedback. After revision, a second draft would be posted followed by the instructor's review and graded rubric. The final document would include the revised essay demonstrating your ability to argue a claim or position supported by citations and references. Instructor and Peer Feedback: When a student posts their eportfolio on the web, the eportfolio will be accessible to a much wider audience than a traditional assignment. An online survey (an abreviated rubric) can be utilized to provide peers and the instructor an opportunity to share insight and comments on documents. In the formative or developmental eportfolio, it is important the instructor fosters a student-friendly “positive learning environment” rather than a “grading environment.” Since the focus is on development, peer and instructor's feedback can serve to motivate a student to improve their documents to showcase their growth and improvement. 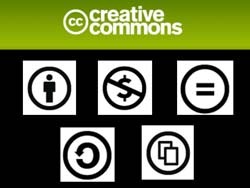 Creative Commons - Graphics, music and videos increase the visual interest of your website. It is important that you ensure that the items you include on any website either are your own works, have been purchased for display on the web, and/or obtained from Creative Commons. Use Creative Commons to find music, images, and movies you can use to build your e-portfolio, as well as, a place to license your own work. One caveat that you should be aware of regarding the use of Creative Commons images, music, and movies. They may not be used for a commercial purpose. If you need items to use an image, music, or video to market a commercial website, a brochure or poster to promote a commercial event or product, or any other for "profit purpose" should purchase a license. Dr. Ralston is an Associate Professor at the University of Utah. The students in her electronic marketing course design and create an electronic portfolio to reflect their accomplishments during the course.